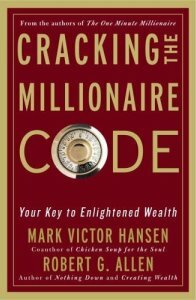 Finished reading Cracking the Millionaire Code: Your Key to Enlightened Wealth by Mark Victor Hansen and Robert G. Allen. Hansen is the co-creator of Chicken Soup for the Soul series. Allen is the author of the real-estate investing guide Nothing Down. They use the term higher power throughout the book in reference to God when discussing business matters. This book uses other made up terms such as loverage and serendestiny throughout the book. The time-honored tradition of tithing plays a pivotal role in this book along with the idea that we all have at least one million dollar idea locked within us. Cracking the Millionaire Code was an interesting book. It was refreshing to see God referred to in a business book but the book begs for more substance.